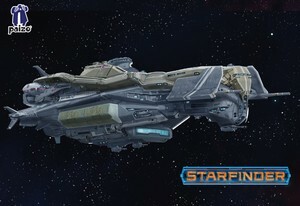 Take to the stars with this, your total audio solution for the Pact Worlds Starships as they appears in the Starfinder Core Rulebook. With sounds for different drive states (Idle, Cruise, Drift Cruise and Damaged), five intense music tracks for space combat, sounds for Pilot, Engineer and Science officer actions, an epic Drift Activation sound and a full compliment of specific starship weapons, with this SoundPack you'll be ready to navigate out of spacedock, engage faster than light travel and lock on phasers to kill. To build your own specific hand crafted Starship grab a SuperSyrin Subscription, and bring the Syrinscape SoundSet Creator online to combine the hull characteristics, engine hums and weapon configurations of your specific vessel. Space travel has never been more easy ...or more perilous!